BRICS are discussing terms of a free trade zone agreement although the bloc is not ready to “rush events” yet, top Russian officials said on Monday. “We are already discussing the terms of the agreement regime… The correct decision is we do not rush events and not grind out an agreement on free trade zone now,” Russia’s First Deputy Economic Development Minister Alexei Likhachev told Russian agency Tass. The Russian Minister claimed “it can happen within five years”. A BRICS free trade zone would be a significant step further in boosting commerce between the rising powers. It would create a uniform economic zone for more than 2.8 billion consumers and eliminate many of the hurdles that obstruct trade across the five countries today. Between 2002 and 2012, intra-BRICS trade increased 922 per cent, according to official statistics. Negotiations for an ambitious free trade zone between Brazil, Russia, India, China and South Africa would be challenging as most of these countries have been accused by the Global Trade Alert (GTA) as adopting strident protectionist measures. The EU and the US are also in the midst of long-drawn out negotiations on the Trans-Atlantic Trade and Investment Partnership or TTIP, which Washington claims would create the world’s biggest free trade zone. Meanwhile, Moscow is aggressively pushing for the newly-proposed BRICS free trade zone. “At first it will be a declarative document that will inspire our countries to cooperate more actively. Then it could be non-preferential agreements, which optimize regulatory system, simplify customs and investment procedures, create the so-called “green corridors” for goods. The third phase is a preferential regime – concessions that we will make in terms of commodity trade,” Likhachev said on Monday. BRICS countries account for 42 per cent of the world population. The IMF says the combined GDP (by purchasing power parity) of the BRICS countries is $32.5 trillion. 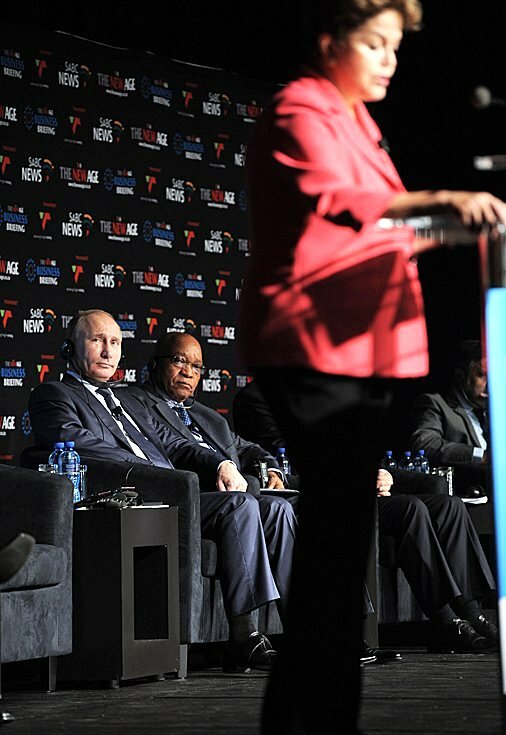 Leaders from the five countries, Vladimir Putin, Xi Jinping, Dilma Rousseff, Jacob Zuma and Narendra Modi will meet in the Russian city of Ufa from 8-9 July to discuss a future roadmap for trade and investment ties within the BRICS. The leaders will also launch the New Development Bank and a $100 billion BRICS contingency reserve fund. Fico muito feliz quando leio notícias sobre as neggociações dos BRICS. Penso que não só eu, como a maioria dos latino americanos, os africanos, indianos, chineses, temos muitas expectativas de futuro para o bem do mundo. Esta iniciativa BRICS, passa muita credibilidade e esperança para nós brasileiros. Agora também para a Grécia, e demais paises oprimidos e explorados que surgirão, é um alento para o mundo ocidental. Que vocês tenham os melhores projetos, as melhores ideias e muito sucesso para a re-evolução que tanto queremos. Um mundo possível para todos nós! Um forte aperto de mãos, gratidão universal pelo bem que irão promover! BRICS Free Trade Zone will be another constructive and a concrete step towards the collective development of 42% population in the world.